Seiko Clinic physician and staff thank you for your allowing us to be your partner in addressing your medical needs. We are ready to meet　the gynecological needs of women, including annual gynecologic examinations, pap smear tests , prescribing oral contraceptive pills, morning after pills, and tests for sexually transmitted diseases. 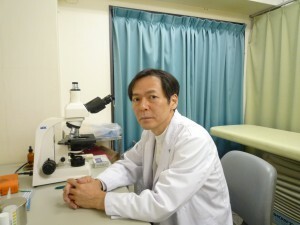 Gynecologist , Koichi Shimada M.D. can speak English. You are able to visit to our clinic without a previous appointment. Please email us if you have anything you wish to ask. Please keep in mind that our clinic is primarily for centered around gynecological care for women, and to help protect their privacy ,we ask that men do not accompany women to our clinic. Thank you for your understanding. 10:30a.m. to noon、and 3:00p.m. to 7:00p.m. Health insurance which is effective domestically can cover doctor`s fee except for birth control pill and emergency contraceptive pill. Our office is conveniently located in the center of Namba,which is easily accessible by Midosuji subway line. You go out of the Exit 24 of Namba Staton. Walking along Sennichimae street about 50m, you can easily see Thickland bldg. Seiko Clinic is located on the 4th floor.